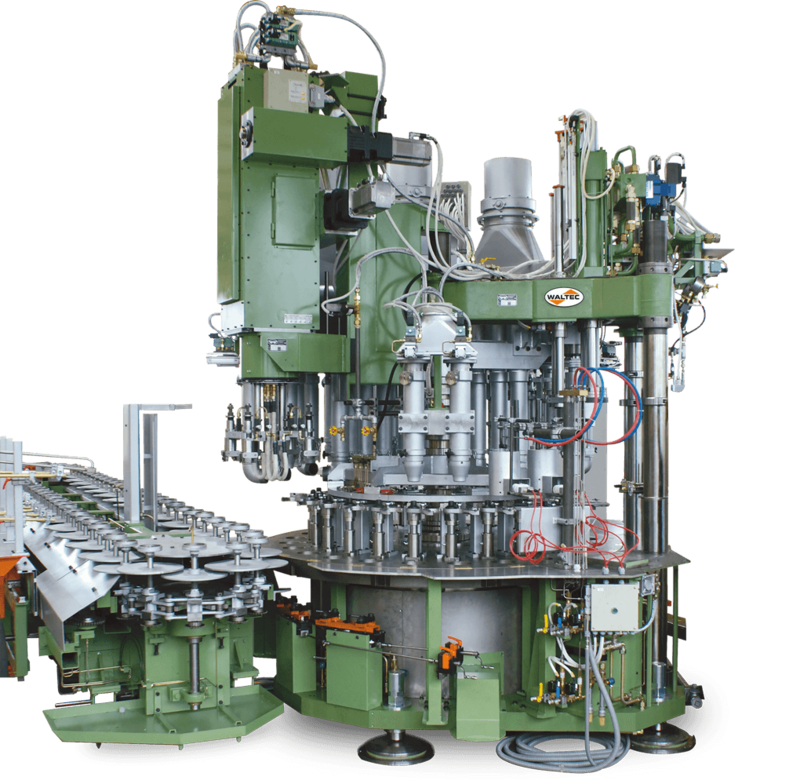 WALTEC supplies presses for every glass article which can be pressed, as well as for all production speeds and capacities. The modular designed glass presses are adjusted to the customer’s predetermined production sequence by using the proven basic machines, and they stand out due to their robust construction. The pressing cylinder has been designed as a controlled servo-hydraulic axis. The pressing procedure can be adjusted with accurate repetition to the respective article by the speed control and pressure regulated pressing curves. The indexing table of the press is time-relay controlled through a servo-regulated direct drive without a gear unit. For 12 years WALTEC has been using gearless, electric direct drives for the manufacture of glass machines with much success. Due to this reason we have used the direct drive as standard table drive for all high-performance press machines since 2010. The special design developed by WALTEC (among other things the segmented coils) offers an extremely high operating reliability. WALTEC manufactures these direct drives, as one of their core competences, in-house. Glass producers compensate the permanent cost pressure by higher output and more energy-efficient production lines. The standard hydraulics does not meet these requirements (image 1) any more. Caused by the design the three-phase motor has to deliver nearly full performance, although it would only be necessary during pressing. Valve indexing times and limited dynamics reduce the necessary process times and thus the production speed. Electrical press systems, realised via servomotor and recirculating ball screw, are maintenance-intensive, and the mechanic parts are susceptible in comparison with the hydraulics. The WALTEC engineers have developed the servo pump (image 2). Hydraulics without valves, where its pump/s is/are driven by servomotor. The resulting high accelerations and speeds do not reach the conventional standard systems. With the WALTEC servo hydraulics the operator has at his disposal considerably longer process times with higher production speeds. Caused by the design the motor power is only needed during pressing, permitting energy-savings of up to 80%. Also remarkable: The system works without heat exchanger (oil cooler) and only needs approx. 30 liters of hydraulic oil, when having production lines up to 16 tons of pressing force, which means EFFICIENCY PURE.